A while ago, I was commissioned to make a game of goose for de Boekenkaravaan, so today, I want to shed some light on how this boardgame came about. 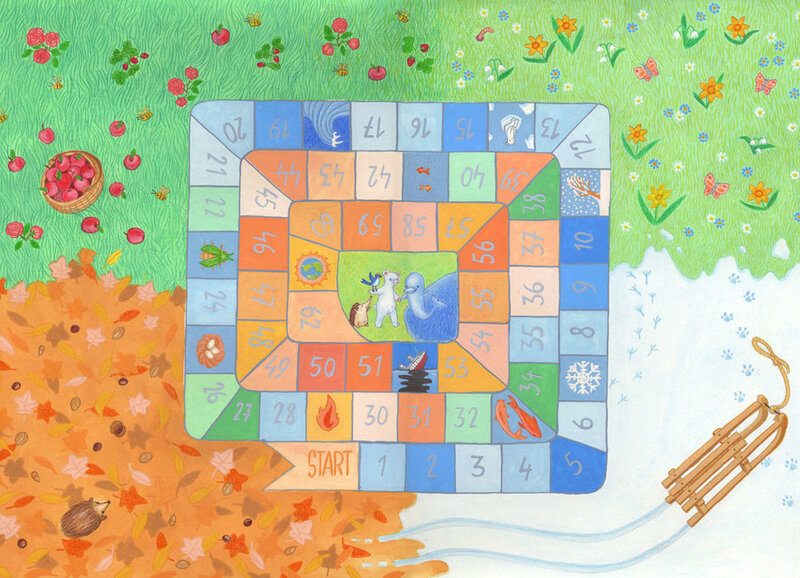 The boardgame was intended to teach children a thing or two about climate change in a playful context, and to install the awareness that climate change has a direct influence on the entire planet and all its inhabitants. Of course this project immediately appealed to me, since climate change and sustainability are things I feel strongly about. 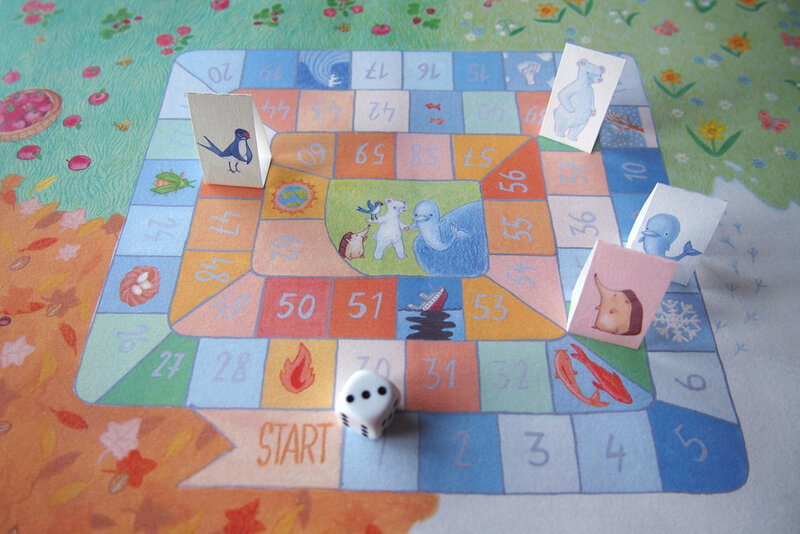 The people at de Boekenkaravaan wanted the game to have the structure of a game of goose (ganzenbord in Dutch), in which the pawns would race to be the first to arrive at the finish, and with special tiles on the board that would set you back or give you some advantage in the race. (I think we all played this game at least once in our lives, so I'm sure there is no need for me to explain the rules any further) They also wanted the pawns to be animals, but apart from these simple guidelines, I was free to fill in the blanks to my best judgement. I was paired up with Lynn Rongé who took care of the copy for this game. Together we decided early on that the animals would each represent a season, and that, while travelling the board, these animals would pass through the seasons as well. Picking out the animals who would symbolize the different seasons was easy: we chose a swallow to represent spring, a dolpin for summer, autumn would be symbolized by a hedgehog, and winter would be a polar bear. While playing, the animals would come across things that would have a direct impact on them due to climate change. Those tiles could set back some animals, but could leave others unaffected or could sometimes benefit them. So, on their journey, the animals would have to deal with early frost, early thaw, heatwaves, forest fires etc. Now that the concept was clear, it was time for me to design the game. While this concept surely triggered my imagination, it was also clear to me that it posed some difficulties design-wise. For instance, the four animals we chose all lived in different elements: one lived in the sky, one in the sea, one on the ground, and one partly in the sea and on the ground, which raised some difficulties in designing a landscape in which all of these animals would be able to travel together. A second thing was that the board also had to show the passing of the seasons in some way, while still retaining a visual harmony. Normally, I would show you the sketches I made here. But I have to admit that when I'm trying out a lot of different ideas on paper for my own eyes only, those sketches tend to look rather rudimentary, and although I might be able to read them perfectly, I doubt other people would make much of them... But I do promise to show sketches in my next blog post! After I made all of these different sketches and saw what didn't work, I decided to go back to basics, and keep it simpler, balancing all of the elements to match each other. I decided to refrain from showing an intricate background landscape that featured different continents, and I also simplified the color palettes to show the seasons. Instead of four, clearly defined color palettes, I chose soft light blue hues for the colder times, that would gradually change to creamy orange hues for the warmer seasons. As for the tiles: in stead of the wilder, swirling routes the tiles took in some of the sketches, I now opted for a soft, boxy spiral to fit all of them. I also designed the animals with softly rounded, boxy lines, to make sure that they looked in harmony with the board itself. For the background I ended up with one grassy meadow, that would have a different appearance in each corner of the board, to represent the passing of the seasons. I chose gouache to color the illustration, to give it an opaque and substancial look, and colored pencil to add details. Below you can see the game as it looked in the newsletter, ready to be printed out, play and start a discussion with children. I guess there is only one thing left for me to ask. Who wants to play? I call the hedgehog!